Hyderabad, June 09, 2017: Yashoda Group of Hospitals Group adds a new feather in its cap. The team of transplant surgeons at Yashoda Hospital at Secunderabad has done the First ever Combined Heart-Lung Transplantation in two Telugu states of Telangana and AP. Though surgeons in Yashoda Group of Hospitals and some other hospitals in the state have performed a number of Heart, Lung transplantations to different patients before, it is for the first time that Heart & Lungs were Ttransplanted to a single person simultaneously. A 13 years old girl who came to the Yashoda Hospital, Secunderabad with both heart and lung damaged because of Primary Pulmonology Hypertension(PPH) was saved by transplanting both the key organs. The family of a 27 years old brain dead lady has agreed to donate her organs which had paved the way for this rare Combined Organ Transplant. This complicated transplant surgery involves very costly and completely imported medicines. But the financial help is given by the Telangana State Government and humanitarian support of Yashoda Hospitals Management has helped the girl from lower middle-class farmer’s family to afford highly expensive life-saving Combined Organ Transplant. A special press meet was arranged to introduce the Baby Ch. Nitisha, who underwent Combined Heart & Lung Transplantation to media. Dr. G.S.Rao, Managing Director Yashoda Group of Hospitals, Dr. P.V. Naresh Kumar Senior Cardiothoracic & Transplant surgeon who led the team of transplant surgeons have participated in the meet. Nitisha, a playful girl from Darpalli village in Nizamabad district. Studying class VII in local Government School. OnJanuary 4th of this year during morning prayer at school, she suddenly was fell and became unconscious. Teachers informed the parents of the girl, Ch.Ramulu and Lakshmi who came rushing to the school and immediately shifted their daughter to a private hospital at Nizamabad city. Nitisha was evaluated at that hospital and diagnosed as suffering from Primary Pulmonology Hypertension(PPH) and was referred to Yashoda Hospitals, Secunderabad. “Baby Nitisha came to us with chest discomfort and palpitations. On further investigations, PPH was confirmed and she was decided for Combined Heart – Lung Transplantation” Said Dr.P.V. Naresh Kumar Senior Cardiothoracic & Transplant surgeon who led the team of transplantation surgeons which performed the Combined Organ Transplantation. She was registered under Jeevandan Scheme in the third week of January and was waiting for a donor. On 25th March(Saturday) at about 9.30 PM Dr. Naresh Kumar received information from Jeevandan, that there was a brain dead patient in Aware Global Hospital in Hyderabad. That 27years old housewife and mother of three children had suffered from an intracranial fluid bleeding. The transplant team was alerted and went to evaluate the donor. After due checking, the suitability of the Combined Heart & Lung Transplantation for Baby Nitisha was finalized. Immediately her family was informed about it. Organs were harvested at the local hospital and brought to Yashoda Hospitals (Secunderabad) by creating a green corridor. Meanwhile, the other team of Doctors prepared everything for Historic Combined Heart-Lung Transplantation. Soon after donor heart and lung reached Yashoda Hospitals at Secunderabad immediately surgery was done on Nitisha. The surgery has started a new chapter in the medical history of Telangana and AP has begun at 3.45 AM came to end after roughly eight hours at 11.30AM. The patient was shifted to ICU in stable condition. She was on a ventilator for about 36 hours and recovered well. She was shifted to a room from ICU after 2 weeks of transplantation surgery. Performing Combined Organ Transplantation like Heart – Lung, that too at very short notice is a challenge. “Having highly experienced surgeons, specially trained supporting staff, state of the art medical facilities at Yashoda Hospitals has made us confident of taking up the challenge and complete it successfully,” said Dr. Naresh Kumar. 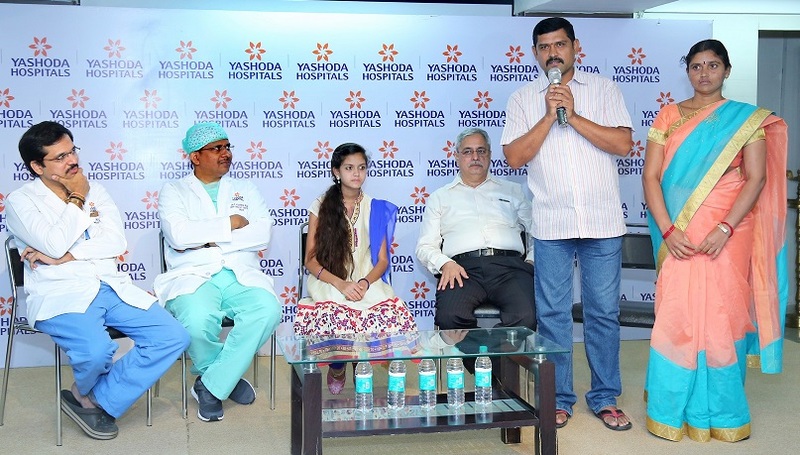 It’s no wonder that Yashoda Hospitals which is forging ahead by a large number of Organ Transplantations has created a record by successfully completing Simultaneous Heart & Lung Transplantation to a single person, a girl of 13 years.Now 75 days after Combined Transplantation of Heart & Lung Baby Nitisha is discharged from hospital and doing well. She is now staying at relatives place in Secunderabad and recovering under the careful observation of visiting Doctors, other specially trained staff at Yashoda Hospitals, Secunderabad. Speaking on occasion father of Nitisha, Ch. Ramulu thanked Doctors and Management of Yashoda Hospitals for “ giving second lease of life” his daughter. “We are fortunate that our daughter could get best in the best in treatment at this hospital. We know how expensive to get both heart and lung transplanted at the same time. My daughter could all this with out spending a single Rupee.” he explained with folded hands. Along with all this, it is the financial support of Rs. 25 Lakhs by TS Government and Rs.25 Lakhs from Yashoda Hospitals Groups initiative made Nitisha’s Combined Heart & LungTtransplantation, a leap forward for the medical history of the state practically possible. The management of Yashoda Hospitals has made arrangement to supply all the expensive, imported medicines for. Nitisha’s treatment at a highly reduced price. “This is an extremely complicated organ transplant operation. Needs highly skilled and experienced team of Surgeons, theaters staff with state of the art medical equipment,”said Dr.G.S.Rao, the Managing Director Yashoda Hospitals Group. Because of this rare disease to their daughter, the parents of the girl were scared. But Doctors and hospital authorities gave them courage and moral support to face this. All the people involved were very much hopeful from the beginning. It is with the same hope, coupled with confidence emanated from experience, expertise, the state of the art facilities at Yashoda Hospitals has made Transplant Surgeons team take up and complete First ever Combined Heart – Lung transplantation in Telugu states successfully.